Warm, spicy, chocolately goodness. When the weather outside is frightful, cookies are deeee-light-ful. And this little cookie concoction, well, Santa will likely make you the first stop. You know St. Nick likes his snacks so butter him up with a plate of these. Thanks to Aaron Sanchez for contributing these to Food Networks 12 Days of Cookies what I like to call the Nom-nom-nom-festival. In a medium mixing bowl, using a hand mixer, beat the butter and margarine until creamy. Add sugar mixture, cinnamon, peppers, and vanilla. Beat on high speed for about 1 minute. Beat in the egg white and until the mixture is smooth. Stop the mixer. Add the flour mixture, beating on the lowest speed, just until incorporated. Gather the dough together with your hands and form it into a neat log, 9 to 10 inches long by 1 1/2 inches in diameter. Wrap in waxed paper or plastic wrap. Fold or twist ends of the paper without pinching or flatting the log. Refrigerate at least 45 minutes, or until needed. Put the oven racks in the upper and lower third of the oven and preheat to 350 degrees F. Line baking sheets with parchment paper or aluminum foil. Use a sharp knife to slice rounds of chilled dough, a scant 1/4-inch thick. Arrange the cookies, 1-inch apart, on the prepared baking sheets. Bake 12 to 14 minutes. Rotate the baking sheets from top to bottom and front to back about halfway through. Cookies will puff and crackle on top, and then begin to settle down slightly when done. Remove the baking sheets from the oven and use a metal spatula to transfer the cookies to a wire rack to cool. Allow the cookies to cool completely before storing or stacking. Store in an airtight container up to 2 weeks, or freeze up to 2 months. To spice things up, after the cookies are baked, let them cool on a wire rack, drizzle with dulce de leche and sprinkle chopped almonds on top. OMG. You kill me with these goodies. You must be a hell of a baker. Hon I can't find out how many this recipe makes? Anything with Chocolate in the heading gets my attention. Well my goodness, these sound rather tempting. I was pretty much sold after "chocolate" and "spice" were mentioned together. I am having a cookie exchange in about 3 hours. I wish I had had this recipe! These look so delicious! I can feel the weight piling on my hips from just looking at them! i think im going to have to unsubscribe, my waist line just can't take anymore! Oh yum, I so want! Will definitely have to add these to the list. And while I know you are entirely too cool/popular/fun for awards, there is one waiting for you over at my place. I heart you & your blog! Uh, YUM! That looks wonnerful! Hi All: This recipe makes 36. Sorry I didnt include that JenJen! I might actually make these for a party next weekend. And Jennomacinator....ONLY 200 mg of Caffeine per cookie! Oh agony. those look so good. Do you know I have gained 10 lbs since August---so making these would be like a death sentence for me. I can't eat just one, nope, not my M.O. I'd eat the whole freaking lot. I love all the tasty cookies and things this time of year. 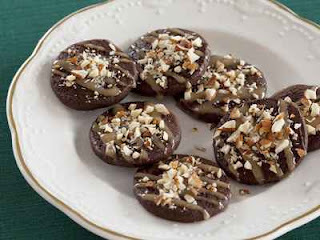 These chocolate cookies look divinely delicious! I will definitely make them. Thanks so much for sharing! How decadent! I need to make these. Thanks for the recipe, sweetness. This time I'm going to email you my home address so you can overnite them to me! YUM! Quick - I feel an emergency coming on: please send me a packet of those yummy biscuits ASAP! Thanks for stopping by my blog on SIT FB day! why do I always hit you on Saturday and Sunday when you have these recipes. Um...yes please. I'm never going to fit into my skinny jeans with posts like this. Holy smokes, those look amazing!!! Sounds so delicious, and perfect for this holiday season! My mouth was watering just reading the recipe. I will try to make these cookies and try not to burn the house down in the meantime. Oh these look like they belong on a bakery shelf! Delish! If that photo is of the ones you made, I am so impressed! Oh that really does sound good!!!! First time here..... that recipe sounds wonderful. Love the post below giving ideas for "doing good"
I'm much better at eating than baking. I'll pass this onto the master chef here. Okay, thanks to you and Blueviolet, I'm now starving. Wow, those look so yummy!!!! Oh yummy I want some right now!!! Lovely blog. These sound so good. I might just have to add them to my list. Cinnamon and chocolate are one of my favorite combos.